Perform large scale airborne LiDAR strip alignment faster and more accurately than existing software using advanced, fully automatic algorithms. No need to preprocess, classify or filter the data. Vertical difference between overlapping strips. Left: original data. Right: geometric corrections applied (high frequency drifts, calibration). 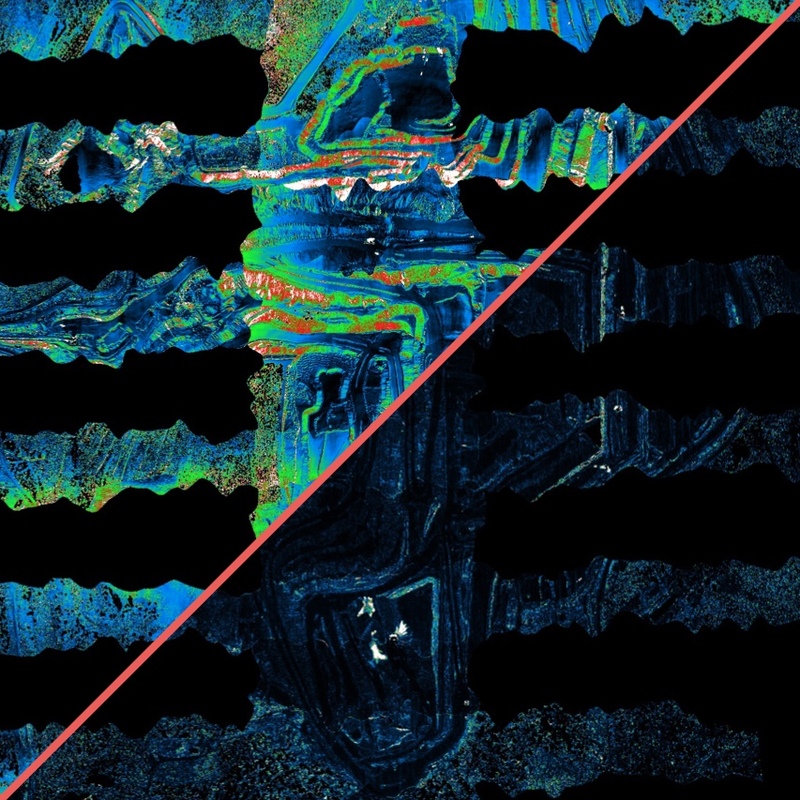 The point cloud registration is robust to vegetation, mismatched surfaces and natural differences between points of view. Optimal corrections are computed automatically from relative displacements using a rigorous model and Bayesian inference. Correcting systematic errors or biases by treating them as parameters and applying Bayesian inference is a powerful way to improve the data accuracy. Strip adjustment is a good example of significant improvement, where both relative and absolute uncertainties can be dramatically reduced, depending on the number of strips and the amount of overlap. Optimal data fusion, or swath combination, helps produce highest possible accuracy elevation models given the collected data. This is possible once the swaths have been properly aligned, so that most biases are eliminated. Manually tuning essential processing parameters is no longer necessary. Grid size, number of iterations, internal parameters, that’s the algorithm’s problem, not yours! 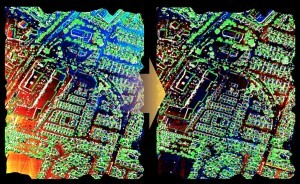 Strip adjustment requires accurate alignment of overlapping point clouds from neighboring swaths. Probabilistic approaches provide automatic ways of computing the geometric transformation between such datasets while being robust to occlusions and noise. Understanding how uncertainty affects 3D points helps perform the alignment in optimal conditions, as most accurate points are given the largest weight. Uncertainty estimates do not come with the data, so we have to compute them automatically when needed. Vertical differences between two overlapping cross-strips, before (left) and after (right) calibration using n strips simultaneously. A standard calibration cross, or any set of overlapping lines can be used, not necessarily parallel or perpendicular. The calibration module estimates one set of parameters (boresight angles, lever arms, 6 internal parameters) for the whole dataset. While boresight can account for a significant part of geometric errors, it is not sufficient to compensate time-dependent IMU errors, this is why we developed HF drift corrections.